I've always admired General Musharraf. Might not be as a leader but as a good daring pubic speaker. I've heard him speak on CNN and the other news channels and he also had an appearance at Comedy Central with John Stewart that was hilarious !! I watched him at the India Today Conclave this morning. It came LIVE here via the 'Headlines Today' channel. And boy, was he as daring as ever. He dodged several questions which was expected, but the one quality, he had the guts to come to India and address such an elite gathering which is admirable. I liked the way he handled himself, though I could see him getting agitated at times and running his hands thru his forehead and hair. 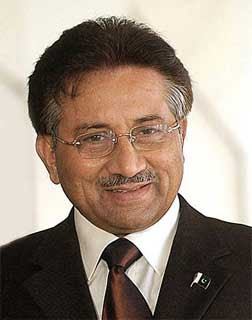 Rarely do we see a leader from the Subcontinent with a sense of humor but I found it ( many times) in General Musharraf. How many leaders ( Gen.Musharraf asked the same question ) from India would dare do this. Can they travel to Pakistan and talk in a conference like this? Can they address the Press and the people of Pakistan like what Gen.Musharraf did today? He had some valid points about India which can only be answered by a leader from India. I wish someone answers to his questions about RAW etc. His point about 'LET'S FORGET THE PAST AND MOVE ON', is what I liked the most. Hat's off to you General Musharraf !. Long live peace ! You can see his duplicity. For me, he is just a low class cheat. Being India, he knows we are pussies and he can come here and say/do whatever he wants. Knowing Pakistan, I dont think anybody will be foolhardy enough to do the same going to Pakistan. I actually blame the organizers for inviting him and giving a platform to speak, knowing well enough that himself, his ISI cronies have Indian blood in their hands. Anon - Indian leaders don't have the guts !! That's what I feel. Don't blame the organizers..I feel it's a great job well done. He made statements about RAW - Any answers from the Indian Govt? An Indian leader (OK, an oxymoron in these times) visiting Pak. is asking for trouble. The cunning general being able to come to India speaks more about our nation than his guts. Diplomacy with Pakistani leadership (democratic or military) is a bit like playing the Strad. to the swines. >> How many leaders from India would dare do this. Can they travel to Pakistan and talk in a conference like this? Can they address the Press and the people of Pakistan like what Gen.Musharraf did today? Ha ha ha what a joke. India is a democracy, so he can some here and speak anything. How can u expect the same thing in pakistan. except islamabad, pakistan is run my Taliban and al-queda. how can our leader go and speak in a terrorist country. Its doesnt matters about his guts. it depends on the place. He cant even speak openly like this in his own country!!! Dont know why I keep visiting this blog and end up commenting too, I guess its because of the naive insights spread on important things. Musharaf has guts to talk about RAW sitting in Delhi and you want an Indian leader to talk about/question ISI/LeT/AQ in Pak ? Is that show of guts ? Pak govt promised 'presidential' security to the SL cricket team and going by first hand accounts, the security was hardly present, leave alone being 'presidential'. Show of guts is OK but first you should not be a stupid. I admire your thought. By the way I could see everyone having a biased opinion in general about people in Pakistan. After all they are our brothers and we were one. Every other decision taken by the Government does not reflect the ideas of an ordinary citizen. It is time everyone shed their differences and try to be kind and good. The feelings are more when we live within borders. I have personally met wonderful people from Pakistan, who are very good human. There is no reason to blame the entire country. We have good and bad everywhere. By the way I could only think of a person like Vajpayee who has that kind of guts. Could not think of any other leader.